Duke Nukem Forever Multiplayer Exchanges Flags for "Babes"
Gearbox put a little male chauvinism into Duke Nukem Forever's multiplayer modes. Gearbox's Randy Pitchford recently teased that the multiplayer modes in Duke Nukem Forever would be "exciting" and tough to describe through screenshots alone. The latest issue of OXM has unveiled these modes, including one that exchanges "Capture the Flag" for "Capture the Babe" (as predicted). Duke Nukem Forever will feature four different multiplayer game types: Dukematch, Team Dukematch, Capture the Babe, and Hail to the King. The modes reportedly feature 8 players per map and everyone wears the skin of Duke Nukem. 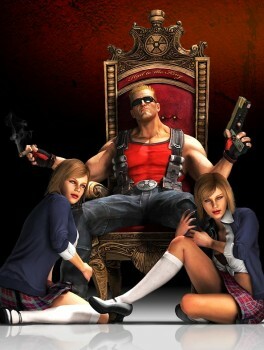 However, Duke Nukem Forever allows players to gain experience points to level up (to a cap of level 42) and unlock "physical customization rewards" which should help everyone become more unique looking. Experience will be awarded for more than racking up the most kills, with Gearbox implementing achievement-style objectives that give extra points. Dukematch is Forever's name for your standard Deathmatch mode. What'll hopefully make it different are somewhat unique weapons and items. It'll feature a jetpack (which is only in multiplayer), steroids for one-punch kills, a freeze gun, a shrink ray, and a holographic decoy called the Holoduke. These weapons were present back in Duke Nukem 3D, but their functions have been updated, such as how the Holoduke now cloaks players. Capture the Babe is exactly what it sounds like. Instead of a flag, players have to pick up a "babe" and bring her back to the home base. The babe will sometimes freak out, and players have to give her a "reassuring slap," which is "more goofy than offensive" according to OXM. Hail to the King wasn't detailed, but is apparently a "King of the Hill" mode. 10 different maps will be available at launch, such as a two-story casino, an Old West-style area called "Morningwood," and the return of "Duke Burger" where players are all miniaturized in a fast food restaurant. Screenshots show mini-Dukes running around the deep-fryer and crouching on jars of "Duke Sauce." Overall, it sounds like a throwback to the days when multiplayer in shooters was easy to jump into and didn't involve dozens of players or complicated objectives. Duke Nukem Forever will be released for the Xbox 360, PlayStation 3, and PC on May 3.